Pair of wing nut cymbal holders for 8 mm shafts. 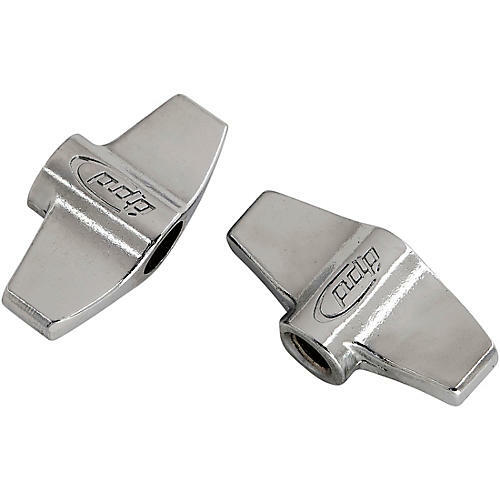 These easy-to-turn, easy-to-hold wing nut cymbal tips allow you to mount and dismount cymbals quickly. With just a few turns, it's off, and after you place a cymbal back on the stand, a couple more twists and its secure, but not taken captive. Get the motion and sway you want. They are low profile, finished in chrome plating and bear the PDP logo. This 2-pack of essential drum hardware fits all standard 8 mm cymbal mounts. Solve an emergency or prevent one. Order today.